Looking forward to a holiday in Bournemouth this new year but want to make sure that you don’t waste your days simply soaking up the atmosphere? There are plenty of options out there to satisfy all your new years resolutions to stay active. Whether you simply stroll along the Bournemouth beach and collect some shells to take back home, or you decide to jump head-first into the action with quad-biking and buggy rides, there’s something for everyone. There are lots of companies offering these types of adventure, starting at around £30 per person. If you have children in your party, watch out for age restrictions. Some activities don’t allow children under 12 years of age to take part so always check before you book. When you picture the best possible active holiday in Bournemouth, what do you imagine? If you like the idea of speed and power, then you should definitely sign up for an extreme quad biking session, an hour or two in an incredible rage buggy, or of course, a game of indoor pro kart racing. Prefer to get your thrills without the helmet hair? There’s plenty of options that keep you off the vehicles too. For instance, you could learn how to surf at the local beach (although this might have to wait until the warmer weather! ), or try out some water skiing sessions for the first time. On the other hand, if you’d rather stay dry, there’s laser competitions, city exploration treasure hunts, and more! 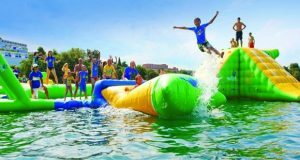 Book an aquapark session: Grab your friends and family and head out into the middle of a lake for a fun and exciting hour on a huge inflatable obstacle course. There’s plenty of laughs to be had for people of all ages and it’s only a short drive from Bournemouth. Grand Prix Kart racing: Rev your engines and enjoy the speed and fun of an incredible karting experience – designed for pros. Zombie Apocalypse Camp: Always wondering what you would do if the undead took over? No need to wonder any more. All you need to do is sign up for Zombie Apocalypse camp, where you’ll learn how to defend yourself, throw axes, and shoot a long bow! With so many things to do – you’ll quickly find that having an active holiday in Bournemouth is easier than you’d think.